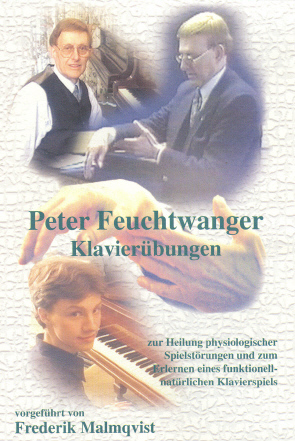 "Piano Exercises for Curing Playing Disorders and for Acquiring a Functional and Natural Approach to Piano Playing"
World-renowned piano teacher Peter Feuchtwanger presents, in a copiously-detailed book and accompanying hour-long DVD, a set of exercises designed to teach improved piano technique and eliminate physical obstacles to playing. Frederic Malmqvist demonstrates the 18 exercises at greater length. These exercises are already well-known in the piano world, and their public availability is to be welcomed. Among the exercises, most involve playing a series of notes with specified fingerings that encourage the smooth, elliptical movement of the hands and fingers, and that allow the instrument to be played with the greatest relaxation of the body. The first exercise, which emphasises the fingers being pushed back up by the weight of the keys returning to the normal, unstruck position, rather than being lifted off by muscular action, immediately makes these principles clear. Similarly, trying the second exercise will give an excellent flavour of what the whole course is trying to achieve. There is no doubting the quality of these exercises, nor the fundamental principles which they embody. These are exercises that promote naturalness, suppleness, ease of movement and flexibility. What Professor Feuchtwanger has done is, as it were, to extract an essence of muscular movement and control out of the total activity of playing and performing music. They are, if you like, muscular drills that rid the body - the fingers in particular, of course - of bad habits and train instead good habits as a second nature. Preparation, as Feuchtwanger endearingly demonstrates, is a matter of having practised in advance of the time of playing, not a case of stiffening up in anticipation of the right movements just before hitting the notes. These exercises above all, teach fluidity, agility and softness. La souplesse avant tout, as Neuhaus frequently quotes in his book. Those of Feuchtwanger's pupils who have tried these exercises have an especially good pianissimo, an almost unearthly luminosity. However, there is need for a number of words of warning. 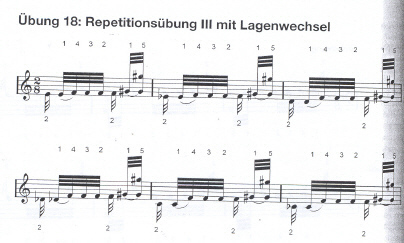 First, fully to benefit from these exercises requires dedication, and indeed, when a student undertakes this type of exercise, a period of time is often prescribed when only or predominantly the exercises are practised, not the normal repertoire, to obviate the possibility that bad habits carried over from existing playing 'distract' from the improvement. Second, tone production and chordal technique, although they require the same principles as Feuchtwanger demonstrates, and spring from the relaxation he teaches, nevertheless require different exercises, or at least a different cast of mind.. Above all, it must always be remembered that the final aim is the music itself - the exercises are a means to an end, not the end in itself. This is all the more clear when we see that many of the attractive features of Professor Feuchtwanger's DVD and book relate to the world that surrounds the exercises, both personal and general, that is, to his compositions, to his relations with other musicians, in particular the pianist Clara Haskil. In another words, Feuchtwanger brings to the specific dimension of the exercises what is already a fully developed musical understanding, as well as the philosophical and pedagogical influences of Eastern and Western thought and of practices that need not be speicifically musical, such as Alexander technique. Unfortunately, I have too often seen in practice that students think of exercises such as these as a panacea, as a kind of 'miracle cure.' 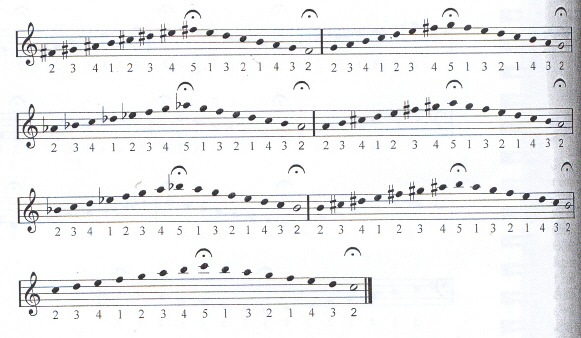 So they master the exercises, and play them with great facility, but then fail to make the decisive step towards applying their improved technique to the music. It need not be exercises - it can be scales, or Hanon, or Czerny. These students are scared, if you like, to venture beyond the safety of exercises into the big bad world of the music itself. And in the end their playing does not improve. This failure could be avoided if students took to heart Professor Feuchtwanger's own words; Most people , he says in an interview, are slaves to technique. But technique is not about playing mechanically and quickly, it is also about tone-balance, colours…. He is also well aware of how relaxation, self-consciousness (or rather, becoming truly self-aware as opposed to inhibitedly self-conscious) and performance are all connected. Better ‘nice wrong notes,' he says, than ‘horrible right notes.' But just as students need to be taught to listen to the sound they are actually making, as opposed to what they are hearing in their heads, so anyone who embarks on these exercises must be willing to accept that they are a tool, not a talisman. We might draw an analogy where a leading sportsman might visit a coach to have certain aspects of technique improved – a golf swing, a tennis backhand, a cricketer's bowling action, say – but where they are already confident in the context of their public activity. These exercises do not teach music, they teach how the body's deficiencies can be removed from interfering with the music. I am sure (and the introductory talk at the start of the DVD gives a flavour of this), that lessons or masterclasses from Peter Feuchtwanger provide that added dimension of integration, of contextualisation, that cannot arise simply from a set of exercises. If I have a criticism of the DVD it is that this could be made clearer from the narrative in which the exercises are presented, especially as currently, the book is available only in German. As the exercises unfolded, I was hoping to find musical examples, even a whole piece or movement, that illustrated their beneficial effect. I was delighted when ‘snippets,' as Feuchtwanger refers to them, were there at the end, but in passages of such brevity that the overall musical improvement could not be easily discerned. Finally, Malmqvist played a whole piece, an etude by Feuchtwanger himself, an imaginative combination of the influences of Indian music and his own exercises. It was, in other words, a composition built out of the exercises. I only wish that it had been a more ‘mainstream' example, one that would show the universal applicability of Feuchtwanger's method. Professor Feuchtwanger comes with an enormously rich musical heritage (he was taught not only by Haskil, but also Edwin Fischer and Walter Gieseking; his book contains drawings, photographs and reminiscences of great interest) and his own considerable abilities (he reminisces at the start of the DVD as to how he reached a high level of proficiency, self-taught by ear from gramophone records playing a semitone sharp). Indeed, it is a shame that he chose the path of pure teaching and composition over that of performance so early. Though rare, the performances of eminent teacher-pianists of the past such as Heinrich Neuhaus remain fascinating. There are many forms of inspiration for those studying the piano, and certainly the inspiration of a great teacher is of immense importance. But arguably, the inspiration that comes from great performance is the most powerful of all.